During any research project, it’s easy to chase rabbits and follow trails that have little or nothing to do with the topic at hand. I recently stumbled on one such topic and thought my readers might find it as intriguing as I did. Perhaps I should have paid more attention in my history classes, but I have never heard of micronations. Have you? According to Wikipedia, “a micronation is an entity that claims to be an independent state or nation, but is not recognized by world governments or major international organizations. Several of these nations have issued coins, flags, postage stamps, medals, and passports, which are rarely accepted outside of their own community.” Fascinating! My most pressing question is why would someone or some group of people declare themselves a nation? Perhaps, simply because they can. HM Fort Roughs, a former WWII fort, is now part of the Principality of Sealand, a micronation formed by Paddy Bates in 1967. 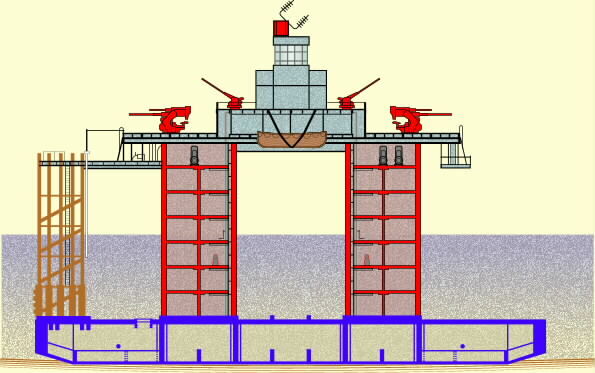 In 1943, the fort was constructed of a floating pontoon base with two hollow towers joined by a deck. It was built to defend the Thames Estuary shipping lanes near the Rough Sands sandbar from German mine-laying aircraft. 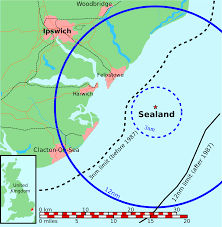 During the war 150-300 Royal Navy personnel were stationed there. Over the years, I have visited many forts (Fort McHenry, The Alamo, Fort Ticonderoga, etc. ), all of which are constructed of brick, stone, or wood, and stand on dry land. HM Fort Roughs is the first facility of its kind that I’m aware of. From the photographs, I find it difficult to visualize how 300 mens could have populated the fort. Thanks to the Harwich Society, there is a diagram and explanation of the layout. Over thirty meters tall, the towers were broken into seven floors. Officers quarters, the kitchen and medical room were located in the center of the platform. What forts have you visited during your travels? Mystery Monday: Who is F. Wills Croft?